A former dry cleaning site was scheduled for redevelopment into residential properties. Site investigations revealed that past laundry operations had resulted in chlorinated solvent contamination within the groundwater. Concentrations of tetrachloroethene (PCE) were increasing with little to no measureable daughter products being observed, indicating a lack of reductive dechlorination occurring in the subsurface. ENVIRON UK Ltd. completed a Detailed Quantitative Risk Assessment (DQRA) for the contaminants of concern on the site and liaised with the regulatory authorities in order to agree on site specific target levels (SSTL) for the remediation project. Anaerobic biostimulation using an electron donor was chosen to biologically reduce chlorinated solvent concentrations. The majority of contamination was delineated around wells BHR1, BHR2, BH3, and BH4. Within the most impacted well, BH4, the total chlorinated solvent contamination had reached approximately 4,000 micrograms per litre (μg/L). 3-D Microemulsion (3DMe), supplied by Regenesis Ltd., uses a 3-stage donor release profile allowing for the immediate, mid-range and long-term release of hydrogen into the groundwater. The hydrogen is used to increase the mass and activity of indigenous microorganisms performing reductive dechlorination. 3DMe was mixed with water to form a microemulsion for injection. Approximately 1,250 kg (2,750 lbs) of 3DMe was mixed with water at a ratio of 20 parts water to 1 part 3DMe and injected using the grid design shown in Figure 1. PCE in well BHR1 (Graph 1) reached concentrations of up to 3,000 μg/L prior to treatment. Approximately one month after the 3DMe injection and following the removal of a concrete slab and excavation works, an increase in PCE and trichloroethene (TCE) concentrations was observed, peaking at 22,000μg/L and 6,300μg/L, respectively. This was attributed to an influx of chlorinated solvents caused by a physical disturbance and a rain event which mobilised contamination from the capillary fringe zone. Despite these peaks, PCE and TCE concentrations declined significantly to approximately 20 μg/L at 17 months post-injection. Concentrations of DCE increased to a peak of 13,000 μg/L as PCE and TCE were dechlorinated, followed by a decline to below 5,000 μg/L. Vinyl chloride (VC) was also detected at approximately 400 μg/L. The total chlorinated solvent mass was reduced by over 80% in 17 months. The chlorinated solvent contamination in BHR1 comprised of 90% PCE prior to the application (Graph 2) with little evidence of significant reductive dechlorination occuring. Following the injection of 3DMe, concentrations of PCE and TCE declined to non-detect with the sequential appearance and degradation of daughter products indicating the decline in contaminant concentrations was due to enhanced reductive dechlorination. Prior to the 3DMe application, concentrations of parent products PCE and TCE were stable indicating a low rate of dechlorination was occurring. Within three months of the 3DMe injection, concentrations of PCE and TCE were reduced to near non-detect levels while DCE and VC concentrations sequentially increased. At ten months post- injections, all contaminants of concern in well BH3 had reached non-detect levels and continued reduction was observed in well BH4. It is anticipated that the long-term release profile of 3DMe will maintain an anaerobic environment for further reduction in this area. 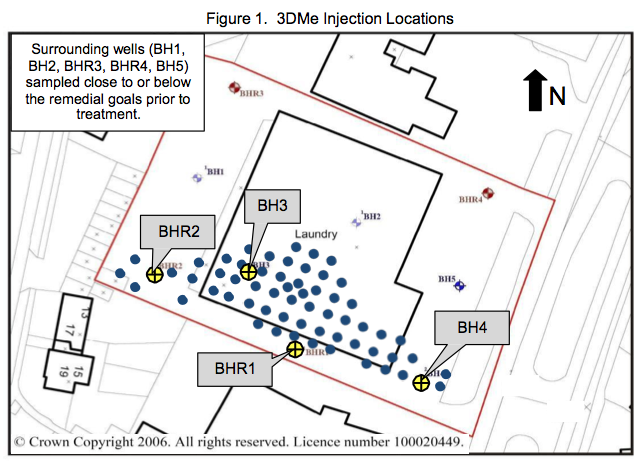 Well BHR2 (Graph 3) contained almost 400 μg/L total chlorinated solvents prior to the 3DMe injection. Within one month of the application, PCE was reduced to 4 μg/L while TCE concentrations initially rose to approximately 130 μg/L and then declined to approximately 15 μg/L. The reductive dechlorination sequence continued as DCE increased to 35 μg/L then declined. Concentrations of VC remained reduced. An analogous spike in PCE concentration was observed similar to that observed in well BHR1 following the concrete slab removal. It is notable that the spike comprised the parent product PCE whilst daughter product trends were not notably affected. This would be consistent with an influx of fresh contamination following the disturbance, while on-going degradation of the original contamination proceeded. Following this peak, concentrations of total chlorinated solvents declined to below 60 μg/L at 22 months post-injection. Before the application of 3DMe, the chlorinated solvent contamination in BHR2 comprised of up to 95% PCE (Graph 4). Following the injection of 3DMe, the PCE concentration reduced by 98% and the TCE declined by 95% within 22 months. As seen in well BHR1, the sequential appearance and degradation of daughter products was observed indicating that enhanced reductive dechlorination was occurring. Prior to remediation work commencing, concentrations of PCE in the groundwater were increasing presumably due to ongoing desorption from impacted soils and infiltration of the capillary fringe zone. Minor concentrations of TCE and DCE indicated a lack of reductive dechlorination was occurring and enhanced anaerobic biostimulation was needed in order to reach the SSTLs. Within one month of the 3DMe application, strong evidence of reductive dechlorination was observed as PCE and TCE declined by more than 96% to non-detect levels and breakdown products DCE and VC increased, then declined. Chlorinated solvent concentrations throughout the plume were reduced towards the cleanup goals within ten months of the 3DMe application, representing a total contaminant mass reduction of more than 80%, despite influx of additional contamination. Further reduction is expected as 3DMe continues to enhance the reductive dechlorination process allowing for continued treatment of the remaining chlorinated solvents. Redevelopment of the site has since been completed with the appropriate regulatory authority sign off in place. The remediation was achieved through a single injection event costing less than £30,000 for 3DMe and application fieldwork combined.